It’s been almost a whole month since I got to write something on here. I guess Mom has been so busy writing her own stuff, she hasn’t made room for me! This doesn’t mean that I haven’t been busy myself. Keeping my sister in line is just about a full time job, and I still have to take care of Mom, too. It’s a wonder I find time to nap and play with all of that going on. And speaking of playing – something really interesting, and fun, has been happening with that here. A couple of weeks ago, Mom was on the phone with this man she calls the Cat Daddy. 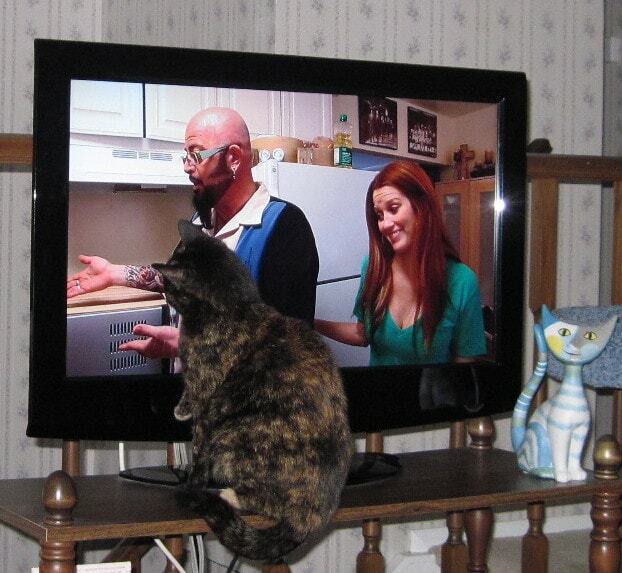 She asked him a lot of questions about something called My Cat From Hell. I know what that is! It’s something that happens on the big screen in our living room. I started watching it with Ruby the other night, but I had to leave the room. It was just too frustrating for me. Some of the cats on that show are so upset with their humans, it got me all upset, too. Of course, Ruby wasn’t bothered by any of it. In fact, she practically stuck her nose into that Cat Daddy man’s face! When Mom was on the phone that day, I stayed and listened to her end of the conversation. Then all of a sudden, I heard my name mentioned. Surely, Mom didn’t think I was one of “those” cats? But then I heard her say “I want to learn how to help Allegra….” Whew! I don’t really know what I need help with. I think I’m purrfect the way I am! But ever since that day, Mom has been playing with us way more than she used to, so I’m not complaining. Don’t get me wrong, she’s always played with us at least two times a day. Usually, she plays with us in the morning after she’s had her breakfast, and again in the evening before she feeds us our dinner. Those are still our regular play times, but now they’re much longer than they used to be! We had a little bit of a glitch the first couple of days after Mom talked to that Cat Daddy man. She put Ruby in the bedroom and closed the door, and then she wanted to play with me. I wasn’t having any of that. Why was my sister locked up? I ran to the bedroom door, and sat in front of it until Mom opened it. Once Ruby was out, I did play some, but I was still puzzled by what that had been all about. The next day, Mom took me in the bedroom with her and closed the door. She wanted me to play with her in there while was Ruby locked out. What the cat? Needless to say, I didn’t feel like playing then, either. Come to find out, the reason Mom asked the Cat Daddy man for help was because she thinks I’m too rough with Ruby when we play together. Okay fine, so I sometimes nip at her when we play chase each other and wrestle, but she’s such a drama queen! The way she screams, you’d think I really hurt her. The little stinker gives as good as she gets, but you don’t hear me screaming! Anyway, the Cat Daddy man told Mom that since I tend to be more deliberate and strategic about playing than Ruby (those are big words, I know, but I’m a very smart girl) and as a result, sometimes miss out on pouncing and chasing because Ruby gets to the toy first, Mom should have individual play sessions with me. What he didn’t factor in is that I hate being separated from my sister. Yes, she’s a pain in the you-know-what sometimes, but I do love her. So Mom took the Cat Daddy man’s advice and modified it a little, and now she’s playing with both of us more. This is so fun! If one conversation with that Cat Daddy man made this happen, I want Mom to talk to him all the time! 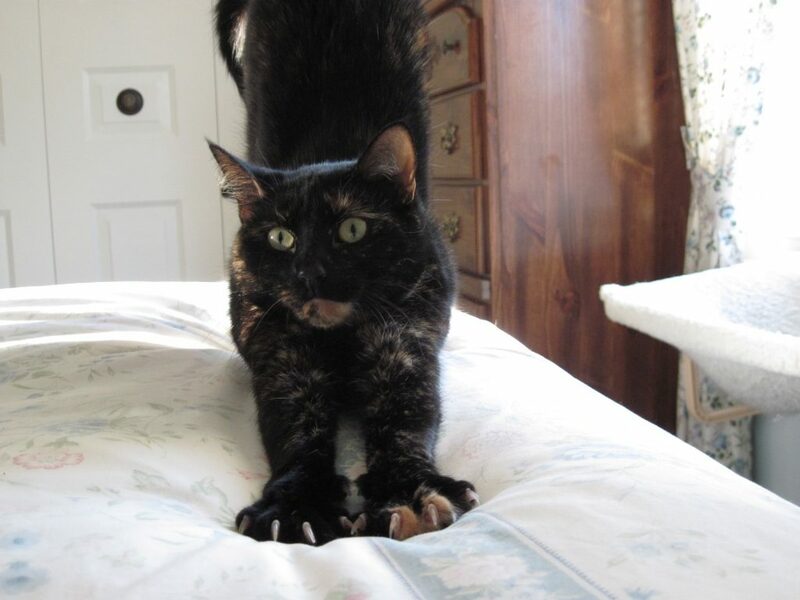 Ingrid’s note: You can read the details about Jackson Galaxy’s recommendation for Allegra here. Jackson’s advice that Allegra needed more play time to burn off excess energy made perfect sense. Since I’ve increased play time and also made an effort to draw Allegra out more even with Ruby in the room, things have improved considerably. Allegra’s energy seems more even, and she doesn’t seem to feel the need to get rough with Ruby nearly as much as she used to. In addition to the play therapy, Jackson also recommended Feline Training by Spirit Essences. I apply the essence to Allegra’s fur to help keep her focused and to reinforce the new play style. We’ve been doing this for a couple of weeks now, and the difference from the combination of play therapy and essences has been quite remarkable. High fives back at Cee Cee from Allegra! Allegra, more play time is always a good thing, and I think it is very sweet that you don’t want to play unless your sissy is there! Allegra, I like that you want to be with your sister. Just remember she is a little younger so sometimes you have to be gentle. Extra play time will be fun for all of you. We all enjoying playing. Ruby may be younger, Esme, but she holds her own! Oh Allegra, maybe it’s time for some leash training in the back yard? Some cats go more stir crazy in the winter because the windows are closed and more cut off from nature. You mom knows how good it feels after a walk in nature. We knew you were never a true bully and love Ruby. Allegra prefers to watch the great outdoors from the safety of the great indoors. Allegra you are not only a “smart girl” you are COMPLETELY delightful and in spite of occasionally nipping Ruby you are one thoughtful sister! 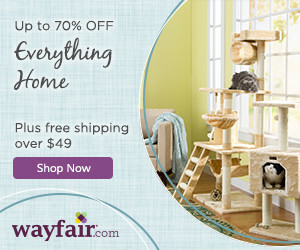 Every kitty would be lucky to have a sister as thoughtful as you! I think that you are probably right in your assessment of Ruby being a “drama queen”…she needs to toughen up a bit! I am sure you will all get it sorted out but in the meanwhile, you continue to be the thoughtful girl that you are and make sure that your Mommy doesn’t separate Ruby when you are playing! The more the merrier! Allegra appreciates the support, Caren! Allegra, you are too cute, not wanting to play without Ruby. It sounds like Mom has things working out all right. Glad you got some help from Jackson. Have a wonderful Wed. So far so good, Marg. You have a wonderful day, too! Very interesting post. Anything to get more playtime for sure. I think if Allegra and Ruby had their way, we’d play all day long, Max.